You can own the perfect pan for any cooking job. 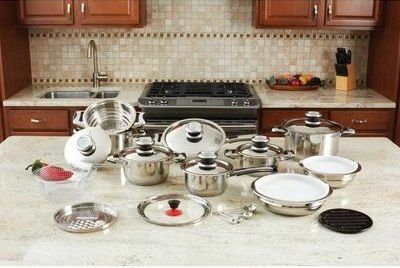 The 28pc 12-Element High-Quality, Heavy-Gauge Stainless Steel Cookware Set does it all! The unique Thermo-Control knobs monitor the optimum temperature for healthy waterless cooking. Efficient and useful accessories work to expand the set. The high-quality stainless steel bowls can be used as double boilers or as dome covers for stove-top roasting. The handy step-steamer fits the saucepan and 4 of the casseroles. Each pan is made from beautifully polished, high-quality stainless steel, featuring high-quality stainless steel capped, riveted handles for a lifetime of durability and performance. Set includes: 1.6qt Saucepan with Cover, 1.6qt Casserole with Cover, 2.2qt Casserole with Cover, 3.1qt Casserole with Cover, Step-Steamer with Side Handles, 6qt Casserole with Cover, 10-7/8" Fry pan with Cover, Large Mixing Bowl with Airtight Plastic Cover, Medium Mixing Bowl with Airtight Plastic Cover, Grater with Removable Handle, Grater Ring Adapter, Deep Fry Basket with Removable Handle, Suction Cup Knob for Mixing Bowls when used as a Dome Cover, Heat-Resistant Pan Rest, and 4pc Measuring Spoons. Limited lifetime warranty. Gift boxed.